I have stayed in thousands of hotel rooms in 36 countries. But I’ve never stayed at a hotel where Housekeeping is even sloppier and more incompetent than I am at making a bed. Until a couple of months ago, when I spent a week at Spangdahlem Lodging (Germany). It was so bad that I turned to the U.S. Army for help. 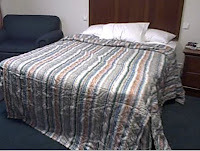 You wouldn’t need three people to remake the bed at an Air Force base, because Air Force housekeeping gets it right the first time. SFX: SWISH – two points in the hoop to Kim (I am not at liberty to mention Kim’s wonderful husband’s high flying position but trust that the context makes this sweeter)…LOL!! !